A full update on the previous quarter’s updates can be viewed here. Anti-social driving in Papworth remains much reduced on this time last year. Following wide consultation with business and local councillors Police did not seek to continue an order put in place between Jan and March to prevent such gatherings. Support from the community for this initiative was impressive, and the team thank all those that gave time to provide statements to support the application. In the future we hope to use the bridges we have built with enthusiast groups to keep the peace in the longer term. Burglary- There has been an overall reduction in the amount of house burglary victims over the last quarter; Girton has seen a good reduction. A small pattern emerged in March in Papworth village and the surrounding villages that has now stopped. Despite the drop in offences we should remain alert, and never be afraid to report suspicious behaviour. A sales persons – who is not asking for money up front, but maybe looking to sign you up to a commitment such as broad band package or an energy supplier. Most of the major energy and telecommunications companies do not employ people directly to sell door to door, so may not have ID from the suppliers but from smaller sales firms. Being a regular concern: we are currently in conversation with Talk Talk to ascertain their policy on door to door sales. Companies such as British gas will only dispatch a sales person to your house if you phone as ask for quote. A rogue trader – someone known to the Police or trading standards as providing sub standard work or who has taken payment far in excess of the value of services they provide. Often referred to as con-men. In general, concerns should be reported to Cambridgeshire Trading Standards on 0345 0455206, they will deal with any transaction over £30. If you feel a person’s is trying to “con” you asking for money on the door step for work they have undertaken then call 999. There are a number of reputable, honest and accredited door to door sales persons. For the elderly, infirm and vulnerable it is very difficult to say no for a number of reasons. 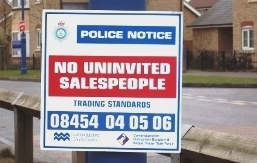 No cold calling zones are set up by trading standards to protect residents from these issues. By far the best approach to take it not to buy or sell anything on the door step. Contact: The South Cambs Police team are proud that we have number of ways for you to keep in touch with us. – You can talk to us in person at our panel meetings or by calling 101 and asking to talk to your local PCSO. – We also conduct face to face consultation by door knocking in your village one a month. – We conduct quarterly online consultation, the links can be found at the web link above, and we are very pleased to have worked with local village colleges to talk with young people about their views on local policing, crime and anti social behaviour. Care Network, a local based charity serving the residents of Cambridgeshire, have recently set up a scheme called The Community Navigators Project. The aim of the project is to train local volunteers and members of organisations to be able to signpost older people to activities or services which they would find enjoyable or useful. This might be a local friendship club or activity group, or somewhere they can get a financial health check or help with mobility aids. All the PCSOs working out of Sawston Police station have received the training required to add the title Community Navigator to their role. They already have a good knowledge of local services and community activities but now have an even greater number of contact details to pass on where needed. Community Care are looking for local volunteers across Cambridgeshire to be a Community Navigator in their own local community. If you feel this is something you would like to get involved with you can contact them on 01954 212100 or on community.navigators@care-network.org.uk. 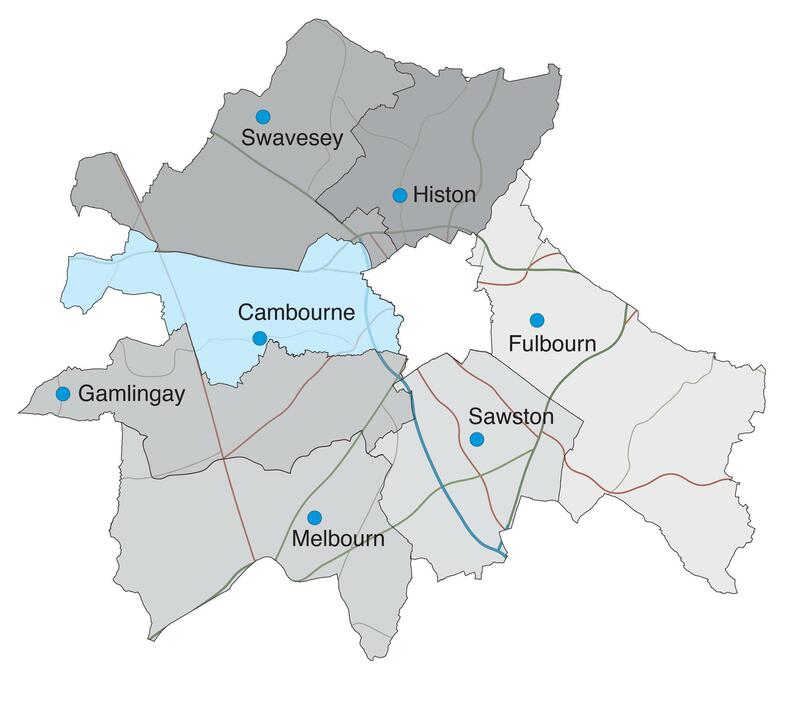 The local co-ordinator for South Cambridgeshire, Rob Wallace, is coming to speak at our next panel meeting which is being held at The Fulbourn Centre, Home End, Fulbourn at 7:30pm on Tuesday the 18th of June. It would be great to see you there. As the Internet and social media help communities spread crime prevention advice, we are now inundated by messages about scams and confidence tricks. So who should we trust? When reading letters, email, or shopping online we have time in our own homes to decide who we trust, research our choices and make a decision. One of the reasons that door step selling works for retailers is that it puts residents in a position where they have to make a quick decision about a purchase. So what’s the answer? Firstly, make the choice not to buy or sell anything on your door step. Most traders or sales persons will leave if you tell them this. You may need to resist the natural urge to be polite, and close the door as many sales persons will continue to talk despite your verbal refusal to buy or sell. If anyone makes any kind of attempt to enter your home without being invited or refuses to leave call 999 immediately and tell them “I am calling the Police”. Sales persons/ reps – who do not ask for money up front; but maybe looking to sign you up to a commitment such as a broad band package or an energy supplier. There should always be an opportunity to cancel a contract within 7 days in any circumstances. Most of the major energy and telecommunications companies do not employ people directly to sell door to do. Do not expect to see identification from agents working on behalf of other companies, our advice is not to engage with these people as there is no way to verify who they are. Some mobile phone companies have previously, allowed third parties to work door to door to sell their products without any formal identification or accreditation. There is no fast way of finding out who they are by calling, so again we are forced to recommend that you do not engage with them. Companies such as British gas will only dispatch a sales person to your house if you phone as ask for quote. This is a far safer way of knowing who you are talking to is genuine. A hawker or pedlar – a salesperson who is selling door to door and requires immediate payment (often selling small items such as dusters etc). This is a licensed activity, and anyone doing this must have a licence and produce it to you. If the sales person cannot provide a licence to you, call 101 to report these persons and Police will attend and the pedlar could be prosecuted for not having the correct licence. A rogue trader – someone (often known to the Police or trading standards) providing sub standard work or who tries to charge far in excess of the value of services they provide. They are often referred to as con-men. In general concerns should be reported to Cambridgeshire Trading Standards on 0845 404 0506, they will deal with any transaction over £35. These types of transaction require the trader to give you a 7 day cancellation period and a notice on how to cancel. If there is no 7 day notice provided then the trader could be prosecuted and the contract is unenforceable. If you feel a person is trying to “con” you by asking for money on the door step for work they have undertaken then call 999. There are a number of reputable, honest and accredited door to door sales persons. For the elderly, infirm and vulnerable it is very difficult to say no for a number of reasons. 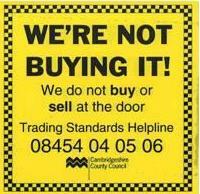 No cold calling zones are set up by Trading Standards to empower residents to say no to doorstep sellers. By far the best approach to take it not to buy or sell anything at the door step. The Swavesey panel meeting is only a few days away. Come and have your say at Over Primary School 7:30 pm Tuesday 21st May. If you can’t make it in person complete the online survey or tweet us during the meeting. The next Comberton area panel meeting is to be held at Comberton Village College on Wednesday 22nd May at 7:30pm. This is a chance for residents to talk to local officers and influence local Police priorities for the next three months. 2) To address the ASB related concerns in Caldecote, Hardwick and Cambourne including drug use in public spaces. Operation Mallet is SouthCambsCops latest drive to get tough on rural crime. Since April Police officers working in South Cambridgeshire have been adapting patrol work to suit the needs of our vast rural setting. Criminals do not have the luxury that an urban area affords them, so have to travel between villages over large distances to commit crime. Officers working in rural areas have to adapt to these displaced and often sporadic crime patterns. Crime trends – Trends such a fuel theft, car crime and burglary rarely happen in one defined area and often do not follow a pattern. What is clear however is that criminals will travel vast distances to find isolated premises and victims to steal from. Operation Mallet is an intelligence led initiative to target the right people at the right times. By analysing vehicle types, preferred location types and “red routes” officers are stopping vehicles being used for crime. In April SouthCambsCops stopped 142 vehicles across the district as part of the operation. Sgt Chris Horton Op Mallet coordinator commented “We have seen real reductions in rural crimes such as fuel thefts and car crime in areas where officers have employed Op Mallet tactics”. Traditional policing? – Op Mallet goes further than having bobbies on the beat, “Over a large rural area we must ensure our officers are intelligence led, and have everything they need to respond quickly to changes in crime” Sgt Horton said, “and our most successful stop searches are generally as a result of community intelligence”. Police are investigating a collision in which a 15-year-old motorcyclist died. The collision happened at about 8.25pm on Friday (May 10) on the A1198 between Bassingbourn and Royston. It involved a Suzuki RM125 motorbike and a green Nissan Primera. The rider of the Suzuki, 15-year-old Benjamin Coxhall, of West Way, Meldreth, suffered serious injuries in the collision and was taken to hospital. However, his condition deteriorated and he died the following day. The driver of the Nissan, a 40-year-old woman from March, was uninjured. Police are trying to determine exactly what happened and would like to speak to anyone who saw the collision or either vehicle involved just prior. Anyone with information should contact the PC Simon Burgin in the roads policing unit on 101. 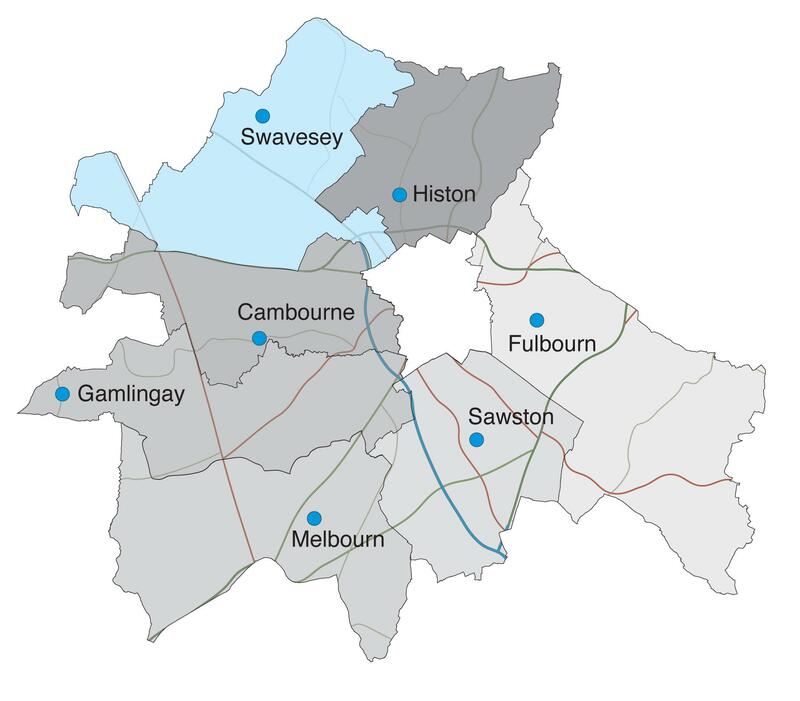 The next Swavesey area panel meeting will be held on Tuesday 21st May 7:30pm at Over Primary School in Over village. Prior to the meeting residents are asked for thier views to help shape the Police priorities for the next three month period. Residents from the following villages can complete the servey, follow the link below. Swavesey, Longstanton, Willingham, Over, Bar Hill, Boxworth, Lolworth, Dry Drayton, Girton, Papworth, Elsworth, Fen Drayton, Conington, Knapwell and Graveley. Rave prevention – We need your help! May bank holiday is fast approaching and recent intelligence has led us to believe rave sites are potentially being identified in South Cambs. The South Cambs region had three raves in four months at the end of last year and due to the recent good weather and our rural landscape South Cambs is an ideal candidate for another visit. Police will be patrolling our rural countryside to proactively prevent such illegal events setting up over the holiday period and we are asking the community for their assistance too. – Gates & padlocks being removed or cropped. – Changes to farm buildings/fields access points. – Suspicious or out of place individuals near said gates, barns or fields. – Unusual or increased traffic in rural locations, particularly in hours of darkness. – Vehicles accumulating at service stations. The impact on the community and demands on Police resources are significant. If Police and the Community work together to prevent a rave before they set up, this sends a clear message to the organisers that this illegal activity is unacceptable. There have also been a high number of gas cylinder thefts over the past week from businesses such as hospital sites and farm buildings.The medical cylinders in particular can contain nitrous oxide and have previously been used to intoxicate individuals on the rave scene. Please be extra vigilant at this time with your gas cylinders ensuring that they are securely stored and have identification markings where possible. This is a timely reminder to all that you know your own communities and what is outside the norm. If you suspect that a rave may be setting up over the weekend – please call us immediately on 101 or 999 if you witness any offences being committed. Residents from Cottenham High Street, business owners, councillors and police officers met to address the longstanding problem of parking on Tuesday 30th April. Nearly thirty residents came to air their views and present ideas, along with the manager from the Co-op and Barker’s Bakery. Sgt Rogerson said “Tackling these issues has been adopted as a local priority. I am delighted that so many people gave up their time to come and brain storm the problem. We will now go and work on a proposal with the Parish Council to present to Cambridgeshire County Council. In the last two weeks since the area was prioritised 15 parking tickets have been given out, and I am sure that this is just the tip of the iceberg”. Residents reported many concerns including having driveways obstructed and being verbally abused by people when asked to move. Residents are encourgaed to call 101 to report unlawfull parking or obstruction. The full minutes from the meeting can be downloaded via the link below.